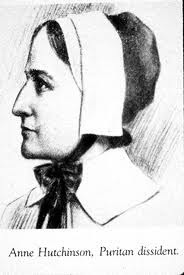 In researching some points about our Puritan Heritage, I learned about this lady. She was an early voice against the patriarchy and the power of the clergy in religion. While deeply devout, she was of the opinion that faith was an individual and private matter between a person and their God. Interesting concept, since it evolved within the atmosphere of the most repressive religion in our history. "Born in Lincolnshire, England, Anne Hutchinson immigrated to Massachusetts Bay with her husband and family in 1634. She was initially highly regarded in the community because of her intelligence and caring nature, but later ran into difficulty because of her religious views and outspoken nature. Hutchinson joined other dissenters in the establishment of Portsmouth, Rhode Island." And so it goes as those with the power, money, connections, etc., continue to discredit the voices of the victims of social injustice...in our case, coerced surrender. The hurtful thing about it all is the ones among our own number who support this patronizing view of our issues. How better to silence dissension than with derision? Thus we get the "bitter and angry" sobriquets that divert attention from our subject matter and focus it on our credibility. As can be seen with the story of Anne Hutchinson, the more intelligent the dissenting argument, the more vicious the protectors of the status-quo become. It becomes a matter of personalities rather than issues. I know of a couple of people that I don't really like very much, but whose views I support and with whom I agree for the most part. I have friends I love with whom I have major disagreements in certain areas. It's sort of like the way the conservatives tried to make a dirty word out of the simple designation "liberal." Names like "socialists," "tree-huggers," and other denigrating labels made what should be a debate of issues into another personality conflict, only this with groups rather than individuals. It's like using the name "birthmother" to identify a woman before she even considers surrender in order to send the message that she is undeserving of her child. With activists, it seems that those who don't agree with us would rather talk about our anger than our issues. To cloud the message, it seems de rigueur to discredit the messenger. It is especially troubling to some that we indict the US government as being complicit in our coercion. It is no secret that the adoption industry is sanctioned by our government. It is no secret that there is big money in this industry, accomplished lobbyists and powerful allies. It can't really be called a conspiracy because that would imply something hidden. The industry, in my eyes, is arrogant and overt, sure they can head us off and beat us down. Meanwhile, our elected officials keep their jobs by pushing the warm, fuzzy but misleading message of infant adoption while ignoring the EMS and the legalized crimes committed against an overwhelming number of young women and their infants. While not especially religious, I have to admire Anne Hutchinson's courage and conviction. She was tried, convicted and exiled. I wonder what the government and the industry will do to us? Think they've already done it Robin. ""She was tried, convicted and exiled."" ""I wonder what the government and the industry will do to us? "" They already did....we were the Ms. Hutchinsons of the 20th Century...minus a voice, minus our babies.